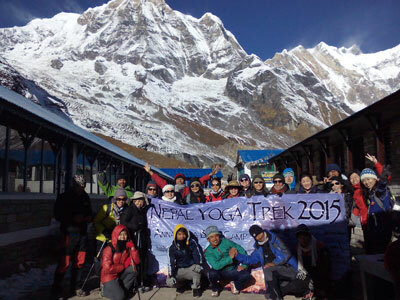 Annapurna Base Camp trek, also known as Annapurna Sanctuary or ABC, is very famous for the beauty of its landscape and up close views of the great Himalayan ranges. Mt. Annapurna I at 8091m/26,545ft is the 10th highest mountain in the world and the journey to its base camp is one of the most popular treks in Nepal. 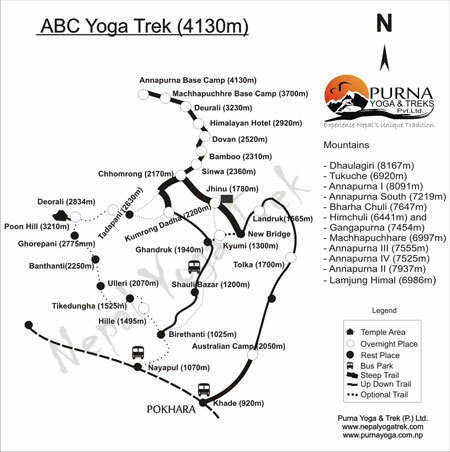 Like any other trek in the Annapurna region, our ABC trek also begins in Pokhara and passes through cascading waterfalls, beautiful villages, terraced farmlands, lush rhododendron forests, and amazing mountain vistas before reaching the base of the mighty Annapurna I. 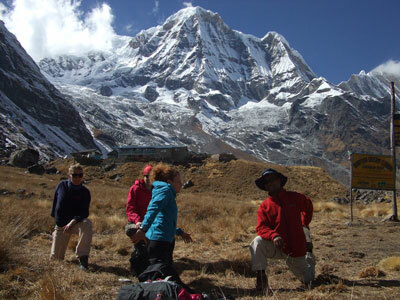 Upon reaching the base camp you will be surrounded 360 degrees with giant snow-capped mountains. The principal peaks of the western portion of the Annapurna range including Hiunchuli, Annapurna South, Gangapurna & Machhapuchhre arranged around you almost precisely in a circle about 10 miles in diameter, with a deep glacier gorge at the center, across which you can see the spectacularly beautiful giant – Annapurna I. You find yourself mesmerized right in the middle of this natural amphitheater, especially at sunrise when the rising sun casts a red glow on the mountain tops. 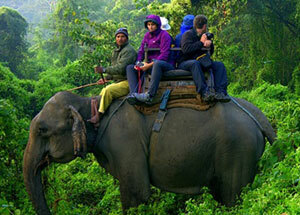 This trek offers you fantastic views of high mountains, landscapes of terraced fields and rhododendron forests, following the valley of the river Modi all the way to its source. 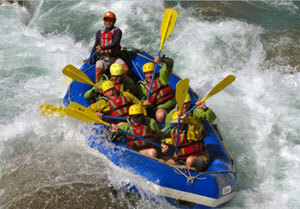 You can witness the birth of river Modi – melting out of glaciers on the side of the mountain slopes, before it disappears under another glacier, to resurface as a true rapid mountain river just at the entrance to Machhapuchhre Base Camp. 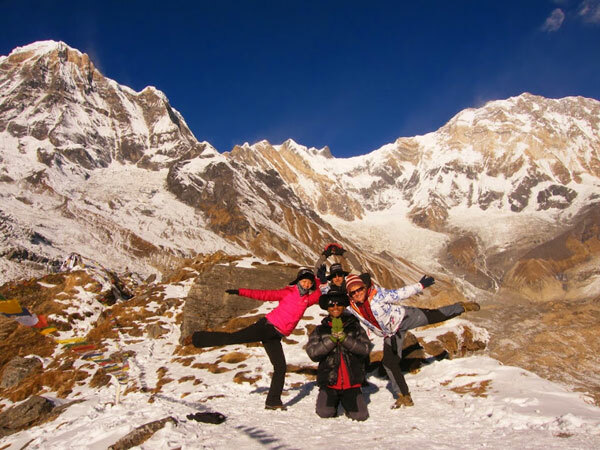 This is one of the best close encounters with the Himalayas within a short period of time and a moderate trekking experience which can be enjoyed and managed by most people with average fitness level. 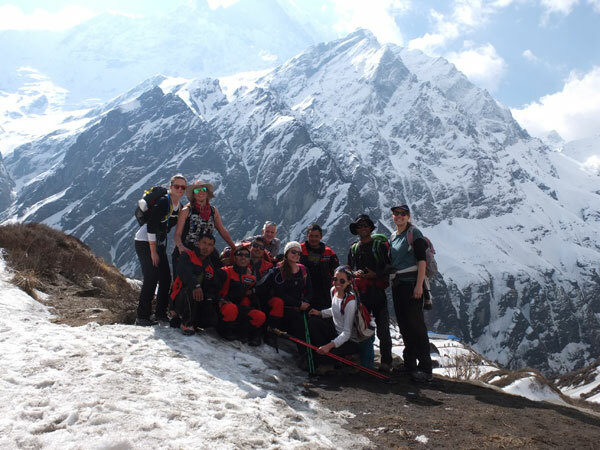 You’ll explore the heart of the Annapurnas as you trek into the Annapurna Base Camp, it truly is the most spectacular spot for dramatic high mountain views, which you will never forget. 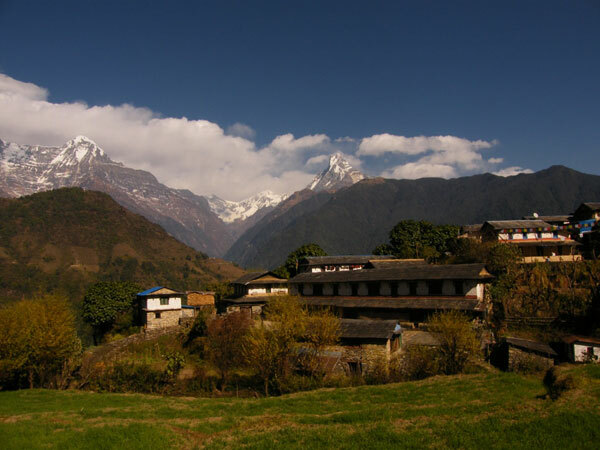 On the way we also pass through several traditional Gurung villages like Landruk, Chhomrong and Ghandruk so we can get a peek at the traditional settlements and witness a different way of life among Nepal’s hills and mountains. Early morning tourist coach transport from Kathmandu to Pokhara. During the drive you will already have stunning views over the mighty Himalayan massifs as well as green hills and dramatic river valleys. 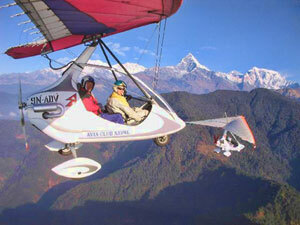 Overnight stay in Pokhara. 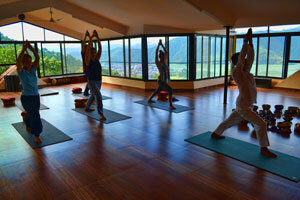 Preparation activities for yoga trek - detailed briefing, last minute shopping and packing. After yoga and breakfast we take a 40min drive to Khade and then trek for 1.5-2 hrs up a steep stone stairs to Australian Camp. 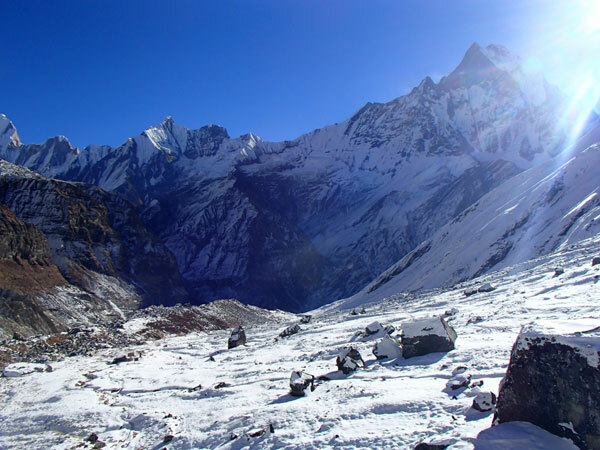 Today’s walk offers a short and relatively easy day, during the journey which allows us to become used to the experience of trekking in Nepal. Overnight in a teahouse. Trek to Landruk leads through small village of Pothana and then through forests, after which we follow a wide trail with great views all the way to Landruk Village and dramatic landscapes of the nearby hills and valleys. Overnight in a teahouse. 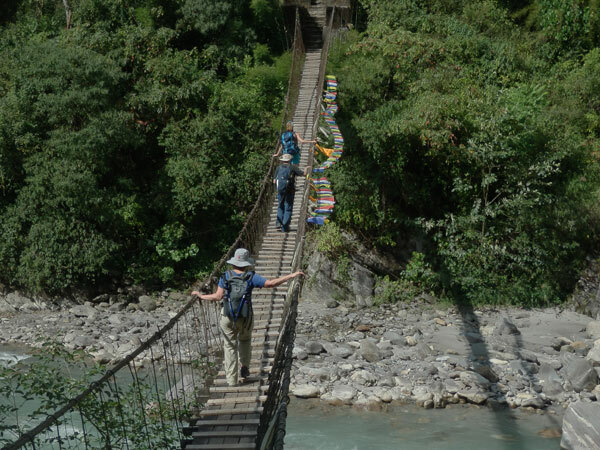 We leave Landruk and cross through terraced fields until New Bridge where we will cross through a long hanging bridge across the river - an experience not to forget. After that we make a steep climb up to Jhinu where we stop for lunch. After lunch we make a a steep stair climb to Chomrong, it can be a tough climb so we take it slow. Overnight in a teahouse. We start the day by descending on stone stair trail down to the level of the river. 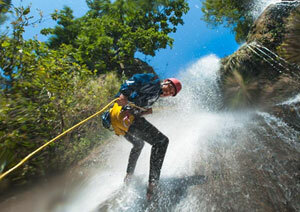 We cross the river and begin steep at times ascend towards Sinuwa where we stop for lunch. After lunch we continue through a forest path to Bamboo. Overnight in a teahouse. 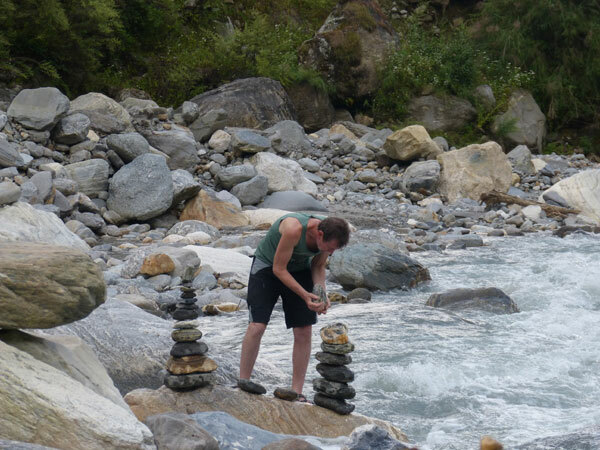 We walk through a forest path and pass through Doban and then a village of Himalaya where we stop for refreshments. 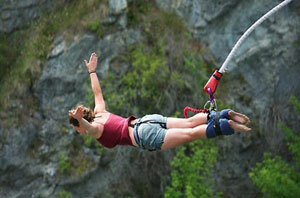 After this we have more climbing to do to reach our final stop for the day – Deurali. Here we notice the vegetaion is changing, getting thin and sparse as we climb to higher altitude. Overnight in a teahouse. 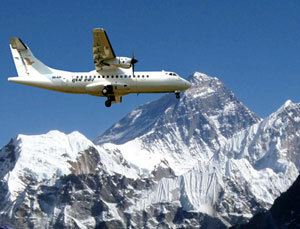 We take it nice and easy as we leave Deurali behind and start our final ascend towards ABC. The trail is not steep but a gradual rise in height. Here the landscape changes as we cross the tree line and enter high altitude meadow (or himalayan tundra) where no trees grow due to climatic harsh conditions of high altitude, just low plants can be seen here. In the winter months Dec-March, the snow line starts just after Deurali. We pass through Machhapuchhre Base Camp (MBC) where we stop for refreshments before tackling the last leg of our final ascent. From here we cross through beautiful barren landscape with fantastic mountain views (Dec-early April lots of snow will be here) and finally we reach our destination of ABC. Overnight in a teahouse. Early morning greets us with a sunrise casting a red hue over the white mountain peaks. Sometimes we may hear what sounds like a muffled thunder – this is the sound of faraway avalanches happening on distant mountain slopes, it’s too far to be seen but it can be heard from a great distance. We admire the natural spectacle of sun casting colorful rays upon the snowy mountains and take in the views before we have breakfast and start our descend to Bamboo retracing our steps of the last 2 days. Overnight in a teahouse. We continue retracing our steps as we descend through the forest path to Sinuwa, where we take some refreshments and continue all the way down to the river where we cross the bridge and the last leg of today’s trek is a steep stone stairs climb up to Chomrong. Today we take a different side trail which leads us to another part of the area, to Kumrung. First we descend on a dirt path leading through some terraced fields all the way down to the level of the river and then make a steep ascend through a forest path to Kot Danda to finally arrive in Little Paradise - a true little paradise among the mountainous scenery where you can relax and enjoy peace, quiet and cosy rural atmosphere for the rest of the day. 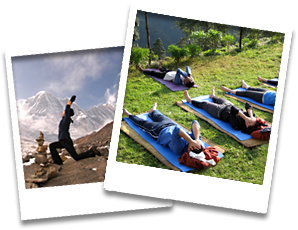 Today we have a choice to remain in Little Paradise for a day’s relaxation and yoga or to continue down to Shyauli Bazaar. 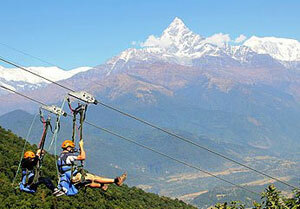 Trail goes all the way down, passing through Gurung village of Ghandruk with wonderful mountain views. We’ll come down to the level of the river Modi Khola at Shyauli Bazaar, from here we can still see the Fishtail mountain. Easy short trek from Shyauli Bazaar back to Naya Pull and a 1.5 hr drive to Pokhara. 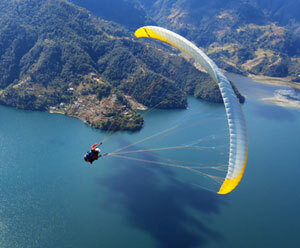 Overnight stay in Pokhara.